Today is Election Day here in the United States of America. Every four years American citizens proudly cast their vote for a new president. It’s the day when Americans are encouraged to vote and believe that democracy is still working. While I do believe that the original ideals of the founding fathers were some of the best the world has ever seen (though far from being anything closely resembling a “Christian” nation), I have been thoroughly convinced that this country was bought and paid for a long time ago by powerful people who now control the direction of the state. If you don’t believe me, just take a look at the major campaign contributors for both presidential candidates. That’s not conspiracy stuff… it’s right in front of us if we’ll rise above the racket and political banter. For those that have been following me here at the blog or at Facebook and Twitter, you know that I have what I believe to be a healthy suspicion of all worldly kingdoms. I believe that Jesus very intentionally rejected the avenues of political power to bring the Kingdom of God (John 18:36). The Kingdom of God is not of this world, but it is for this world. You may choose to vote today, but you need to remember that there is nothing distinctively Kingdom about it. 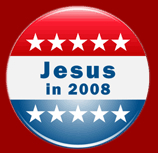 The issues of politics are so complex and complicated, while being filled with lies, corruption, and greedy men, that you should never label your way of voting as “Christian” or your candidate as the “clear” choice for the country. The kingdoms of the world have been hijacked by the prince of the power of the air. We’re promised that Jesus will soon crush Satan under his feet and establish a Kingdom that will never end (Rom 16:20; Dan 7:14). This is the Kingdom of which we’ve been called to build. This should serve as a reminder to us that we have been called to be Christ in our own communities through the methods that Jesus himself laid down for us. Real change happens on the local level by the church being the hands and feet of Jesus through creative Gospel living. When the church is being the church, she is not preoccupied with politics. She discovers that real lasting change happens another way. And it doesn’t look like legislating sin or using power-over people to enforce morality. If the government asks for your opinion every four years and you can give it in good conscience, then by all means vote. But do so under no illusions that you’re doing the pure work of Kingdom building. If you get a tingly feeling or sense some level of euphoria after voting, you may need to rethink where you’ve placed your hope and trust. This also includes you proudly sporting your voting banners and pictures. Think about what you’re doing. Does it look like Jesus in the world? We have a King whose Kingdom is present in this world, though not fully known in the earth. You and I have been called to make it known and further it in the way of Jesus. Are we doing that calvary-style? If you’re a Christian, remember your King today. Rejoice in the reality that he is ruling from heaven and will soon bring heaven and earth together. Why do you think that evangelicals have become so entangled in politics today? How has political involvement distorted the Gospel of the Kingdom that Jesus proclaimed? What does “King of Kings” mean to you? What encourages you most about the message of Jesus in this video?